This is Daisy the lop eared bunny rabbit. Daisy came in to the clinic to be speyed (Desexing a female). It turned out that Daisy was in fact, a boy! The pet shop had incorrectly sexed the rabbit when he/she was young - I might add that this is easily done! A big day for Lenno and an even bigger day for me! I desexed Lenno today. I was a little nervous as performing surgery on your own pet is always a tiny bit daunting. Lenno was very brave and he is now at home as happy as can be. He was on a drip during his surgery and has been given some pain relief so he has recovered very quickly. Here are a few photos for those of you who are interested in what goes on behind the scenes. He even had Foxy there to keep him company! I met another pet obsessed couple on Saturday night (p.s there is nothing wrong with this!). We were sitting next to each other at a wedding and started comparing notes on our dogs. This quickly lead to the retrieval of our mobile phones and a photo album session. There were a couple of photos in particular that I HAD to share with you all. 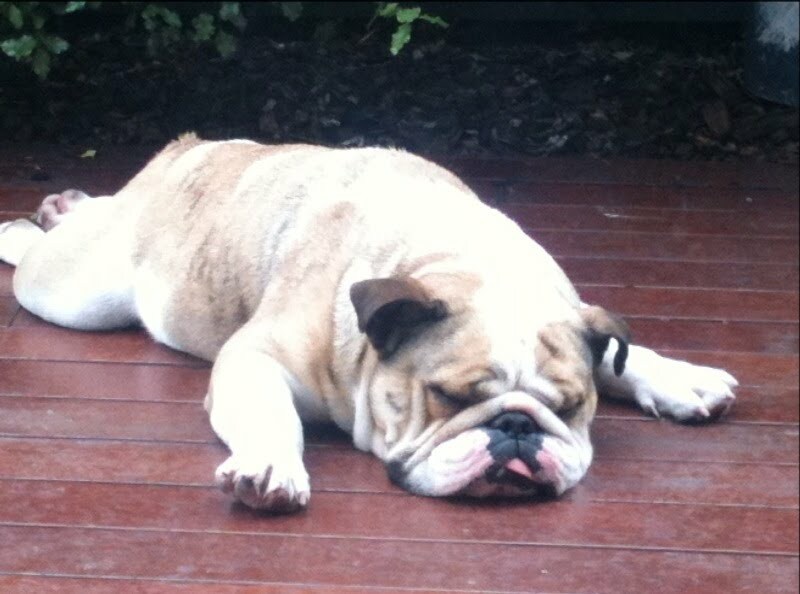 Life's pretty tough for Winston. Here's Winston in a moment of sheer doggy bliss.. This would probably be a pretty good spot to talk about feeding bones. 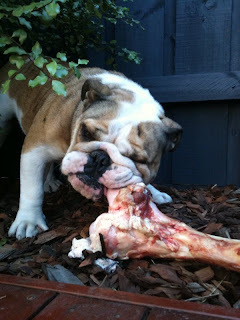 It is OK to feed your dog a bone as long as it is raw. Cooked bones can cause all sorts of problems as they can splinter and lead to an intestinal blockage. Make sure your dog takes at least 10-30 minutes to have a good chew. It is an excellent way to clean their teeth (similar to natural dental floss!). Small dogs do well with raw lamb necks. Long bones (like the one Winston is gnawing on above) are OK for big dogs as they can't be swallowed whole, but the marrow can give some dogs a nasty stomach upset due to the high fat content. It is best to remove the bone before the marrow gets gobbled up, or before the bone dries out enough to fracture your pooch's teeth. Fresh is always best. Now that you have met Winston and have been given a 'bone 101', make sure you return to my blog soon to meet Sir Wijinski, the coolest cat going around. Let me introduce little Pinky! Pinky loves to travel in style! The walks along the esplanade can get a little too long, especially in the heat so a roller case was purchased and now Pinky can enjoy the scenery on wheels. Who owns the road now?! It is no wonder all of the other dogs are jealous! It was a stunning afternoon down at the Brighton dog beach last Thursday. This place is awesome. It is one big dog park but it is on the beach. Your furry friend quickly becomes a wet, sandy little beast! I wouldn't recommend trying to eat your lunch there either (my sandwich was stolen by a naughty beagle). They were having the best time and didn't stop running! These dogs are so good looking! He loved going for a swim and shaking wet sand everywhere after! He was so tired after all the excitement that he was nearly asleep on his little paws! I also met a another gorgeous little dog at Brighton dog beach..stay tuned for the coolest dog you have ever seen...Pinky! I have some very special dogs for you to meet! Wiggans is a 6 month old Tenterfield terrier. He is owned by my cousins. They originally intended to give Wiggans to us as an engagement present...until...they realised he was so cute that they kept him for themselves! Why would you blame them?! Wiggans can be seen here with my cousin Phoebe, wearing his Harrods jacket. Wiggans has another Tenterfield Terrier to keep him company - Angel. Angel is just divine, she is the most dainty little dog I have ever seen. My cousin is a brilliant photographer (far better than me) and I will source some better photos of her! Finally there is the big but very gentle Toby, seen here with little Lenno. "Tobestar" (as he is known to those close to him) is a German Shorthaired Pointer. Toby is everyone's friend but he has been known to steal a baguette from an unsuspecting family at a picnic! Living with Lenno - don't leave me behind! A couple of weeks ago I was getting things ready to head away for the weekend. I packed my bags and jumped in the shower. A little time later I had a small panic attack as I could not find Lenno - he is normally running in and out of the bathroom creating havoc or looking for some shoes to chew (he ate 2 pairs last week after I mistakenly left them in his reach!). And hiding in my bag meant he wasn't going to be left behind!